Up to four monitors can be used at the same time, each containing their own independant virtual screens. Using multiple controllers, many musicians can play on the same machine. Easy and smooth patching, scroll and zoom at will in a fast OpenGL-rendered patcher. 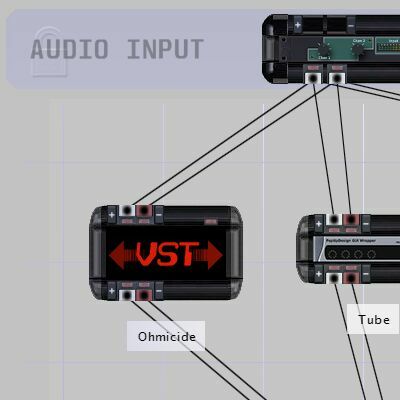 Patch mode is the step where you define what kind of instruments and effects you will be playing with, and how they will connect to each others. 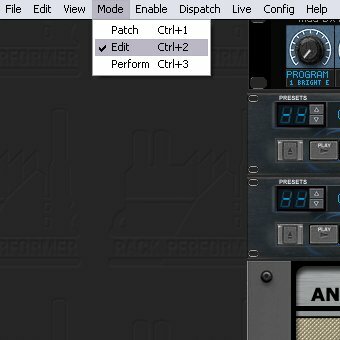 During the preparation stages, you'll be switching between Edit and Patch modes a lot, until you know precisely what you'll be using. But once you are ready to perform, all this complexity is completely hidden and out of your mind and of your way, so you can focus on what is really important. 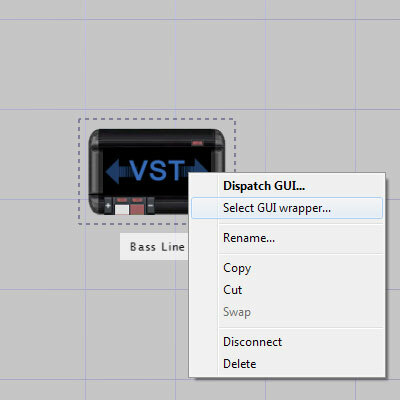 After having dispatched module GUI's on the Virtual Screens, you can prepare, compose and arrange your performance in Edit mode. Edit mode can be seen as the composition, rehearsal and preparation mode. Define controller routings and mappings, dispose module interfaces, prepare all kinds of details and tweak knobs until you are satisfied with the result. This is where the musical creation process actually takes place. When you are ready to go on stage, enter Perform mode where all unsafe actions are disabled, and play your music without any risk. So that's it, now you are ready, you can hear the crowd in the big room a few meters away from your lounge, pression is building up... but what if during your show you inadvertently hit the wrong button and ruin the performance? Relax! 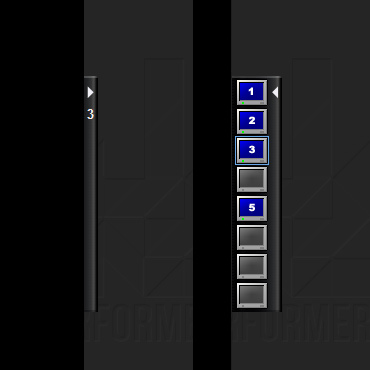 In Perform mode everything that could be nasty to the sound or that simply doesn't make sense in a stage performance context is completely disabled or hidden. 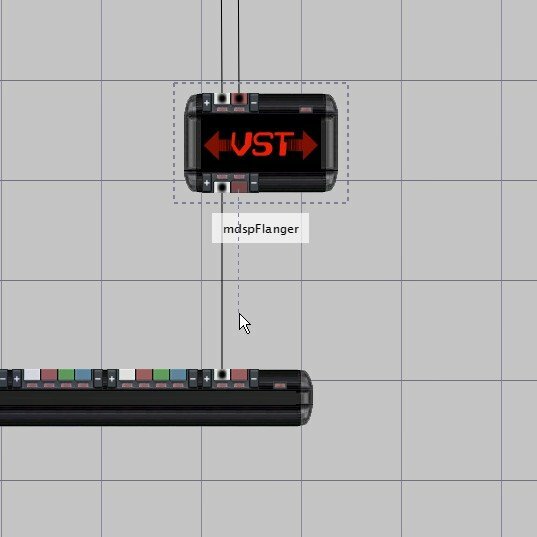 On-screen video overlay displaying various real-time status messages, like mode changes, keyboard map and focus navigation, etc. Sometimes you need visual feedback, and that's what the ticker is for. Of course, don't worry, if you find it annoying or have no use for it, you can filter the kind of messages displayed to keep just the critical ones. Never ever have a transport bar get in your way! With auto-hide and a very slim design all synchronization and master clock controls are always accessible quickly but won't waste your screen real estate. But look, it's packed with features to ease external synchronization by hand (free-running) or in slave mode (external clock) , like tempo tap, tempo skew, and sync to push. 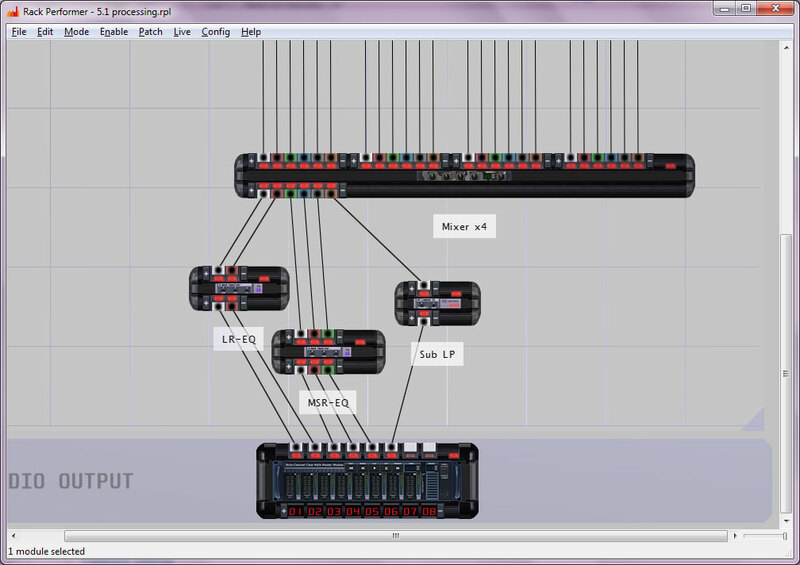 Instant focus on the selected module makes all controllers converge for real-time live interaction. 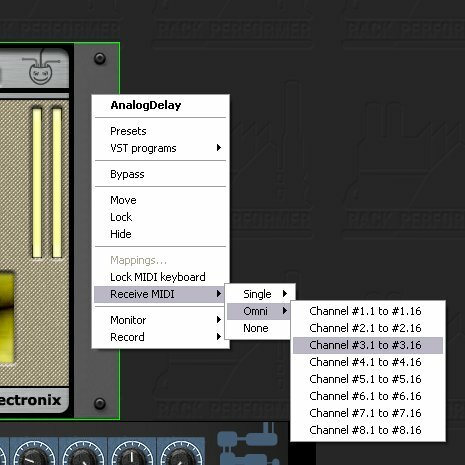 Use a single MIDI keyboard to play and record all your instruments, it's automatically redirected to the focused module. 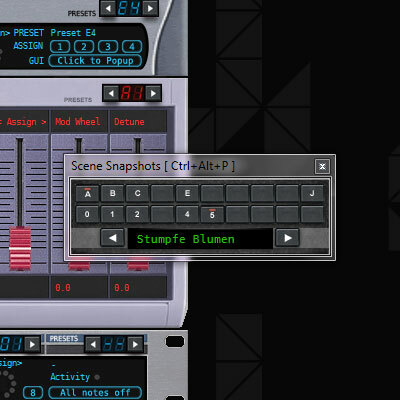 Just setup the channel where your MIDI keyboard is plugged, and start stomping those keys! 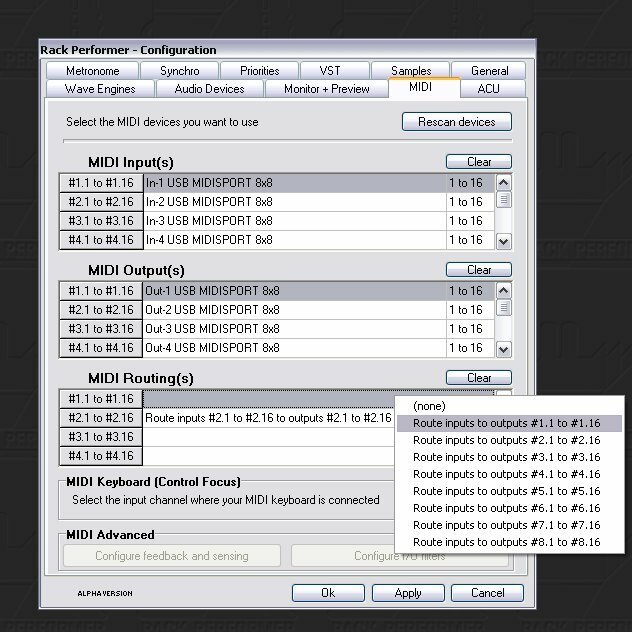 MIDI keyboard input focus can be locked to any module such that it doesn't follow module control focus anymore, until unlocked or set to another module. Monitor any point in the patch in real-time and switch between sources on the fly with your controller. You don't remember what that sample is or how that synth will sound using this preset? Just plug your headphones at the correct location and listen! 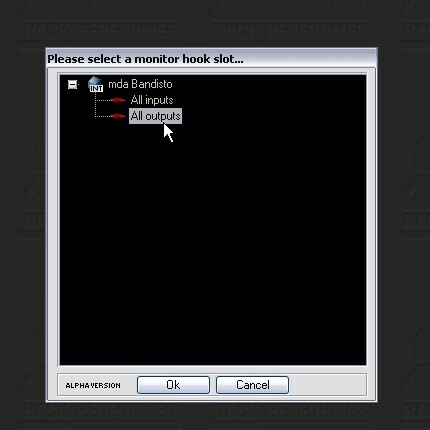 Be it pre-processing level or post-processing level, individual channels or all at once, and even internal module "cue" slots, you can plug your monitor at any point in the whole patch with just a few clicks or using your favorite controller. 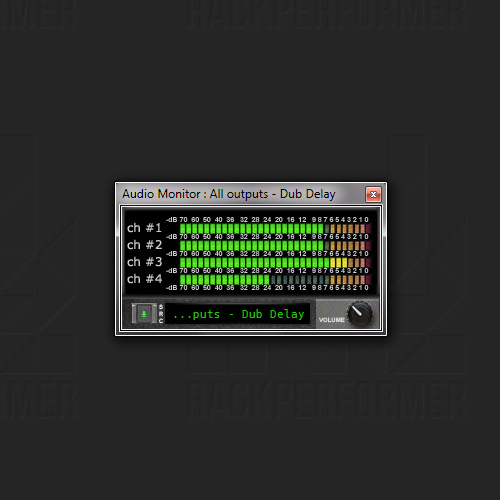 Simplified audio monitoring mode using active document output channels to overlay audio samples preview, when no dedicated channels are available. 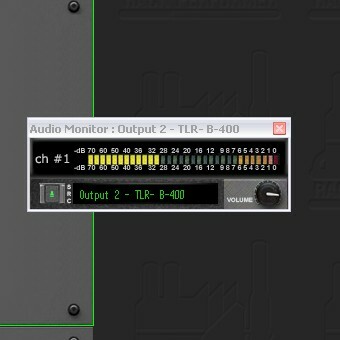 You may call it the cheap man's monitor, but at least it allows to preview samples before loading! 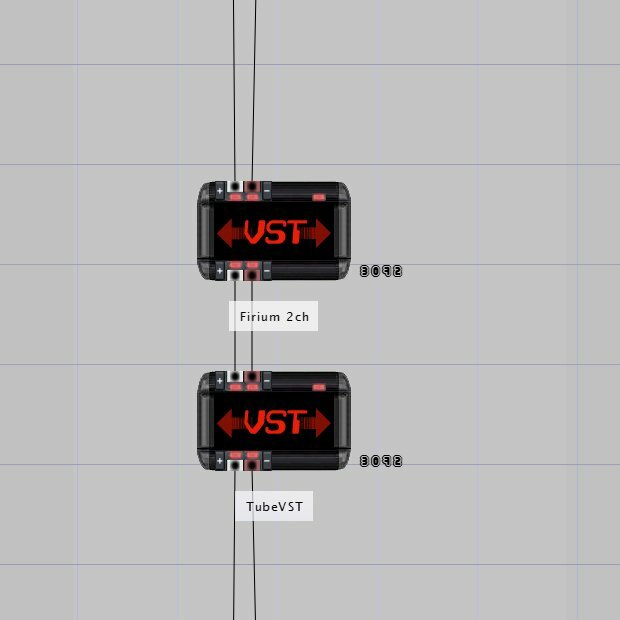 And while it's not ideal in live situations, it can prove useful during edit and setup phases to peek at various patch points in order to setup and fine-tune effect chains. 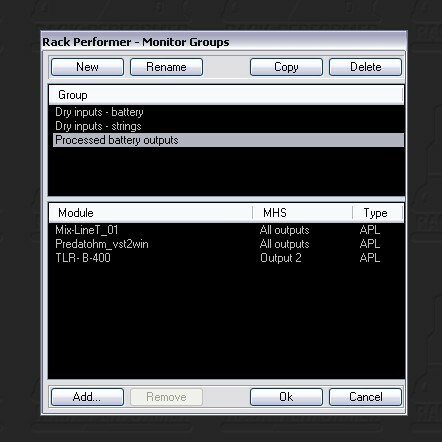 Create and recall any number of monitor groups. Monitor groups can include any monitoring point in the patch. 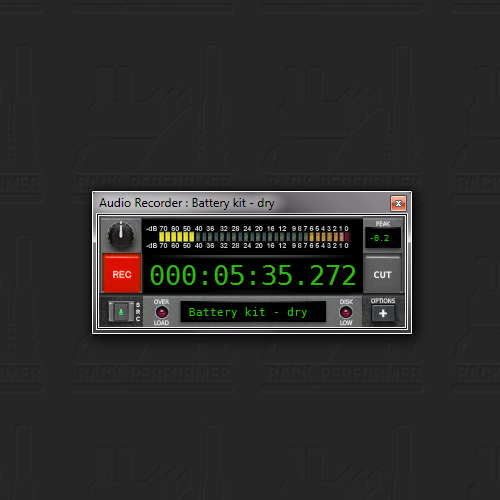 Groups could be made for instance to monitor all audio channels of an external battery being processed, first at the dry level, then at various post-processing points. Groups also make possible to cue/pre-listen to many instruments or audio sources before triggering or enabling them. Complete multi-channel real-time audio recording support. 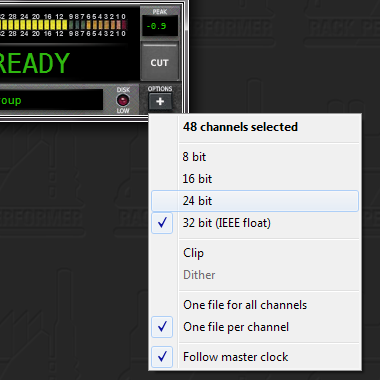 The recorder can stream to disk any number of channels from any point(s) in the patch. 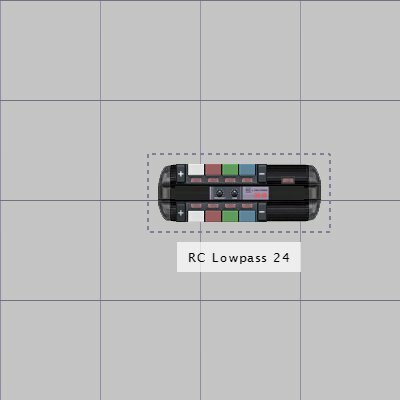 The audio recorder can be mapped to external controllers and with the follow-clock option and external synch on, the process can be fully remote-controlled and slaved to any external transport master device. Multi-channel files can be created (one file containing all source channels) or one individual file per channel (slightly more disk intensive) There is no limitation to the amount of simultaneously recordable audio sources. Files are automatically converted to the EBU RF64 file format (RIFF-64 Broadcast Wave Format) when their size exceeds 4GB. With record groups you can switch the record source to your pre-configured selections and create complex assignments, like specific channel groups, or distant sources combinations. Preset numbers of any module can be linked together such as changing any preset in the link will also change all linked members. The Live Synopsis offers a clear and intuitive way to manage all mappings from a centralized location, in a simple and efficient hierarchical way. 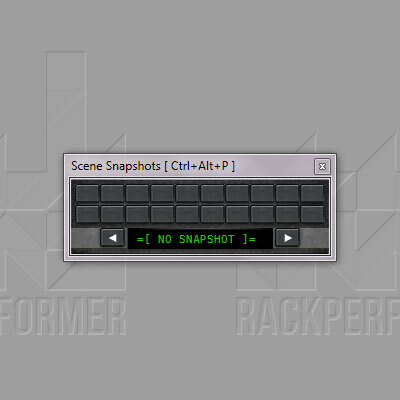 Many options allow to select how samples should be loaded in RAM (one-time vs real-time resampling) and samples can even be locked to insure no swapping occurs. 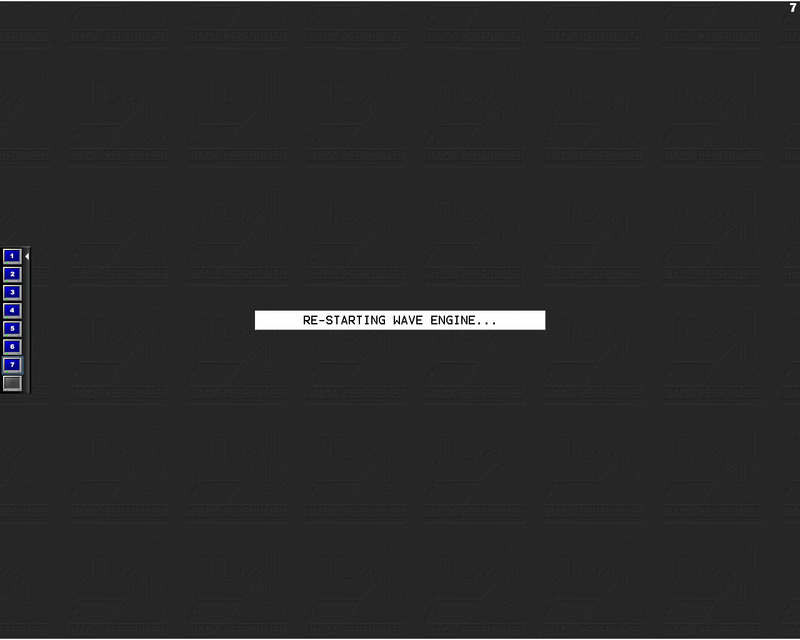 Live-sets are collections of individual live files. 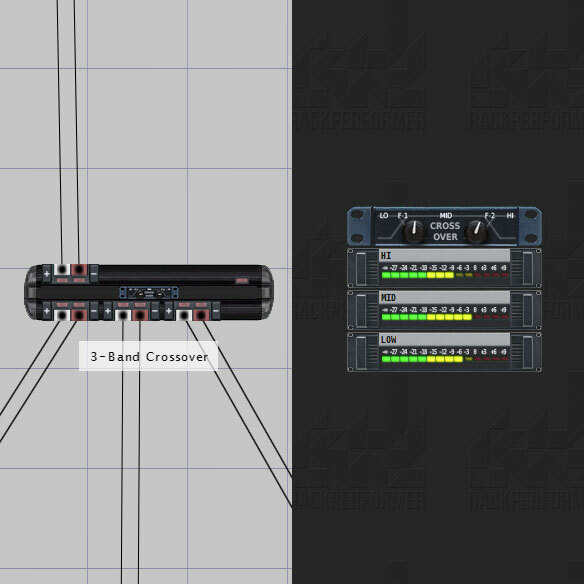 By grouping files together it is possible to have a completely different patch, samples and mappings configuration per song during a concert, and to switch easily between them. 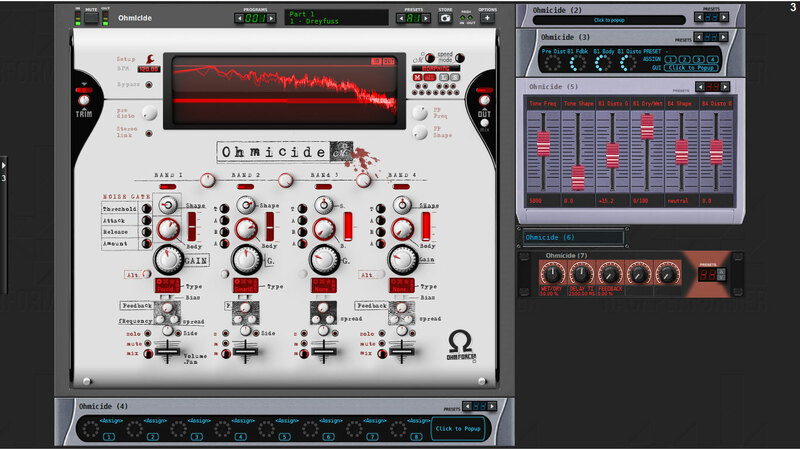 Large choice of built-in mixing and processing effects modules, including various samplers, mixers, filters and many more. 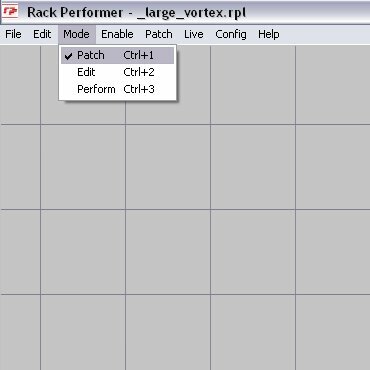 please read this page: Rack Performer - all modules. 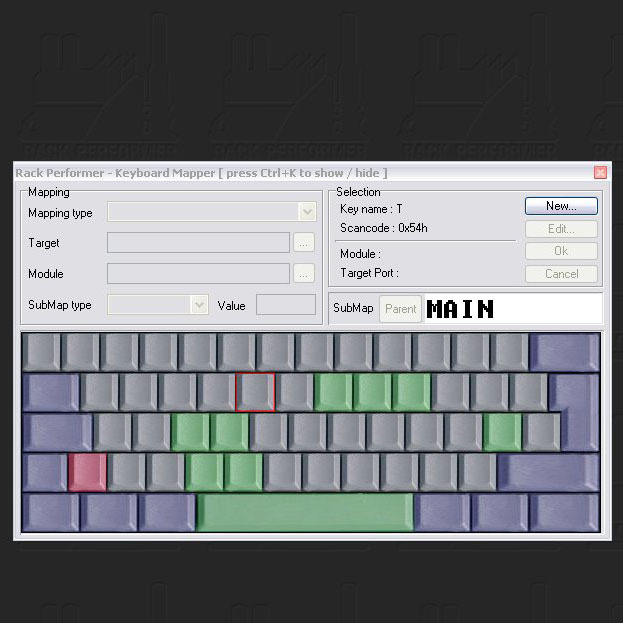 Transform your keyboard into a powerful controller by using the keyboard mapper which offers almost limitless possibilities. 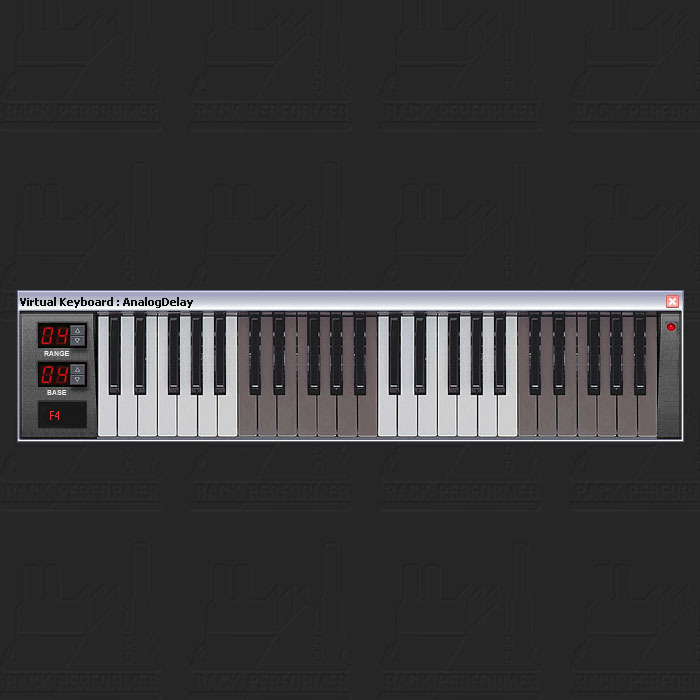 The keyboard can also be used to send notes to the target module, if you don't have a real MIDI keyboard at hand. 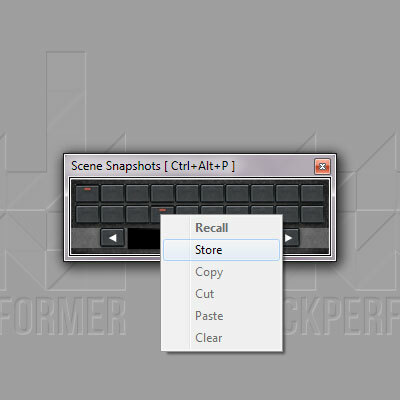 Advanced keyboard mapping option allowing to create multiple maps and navigate into them in a hierarchical way. 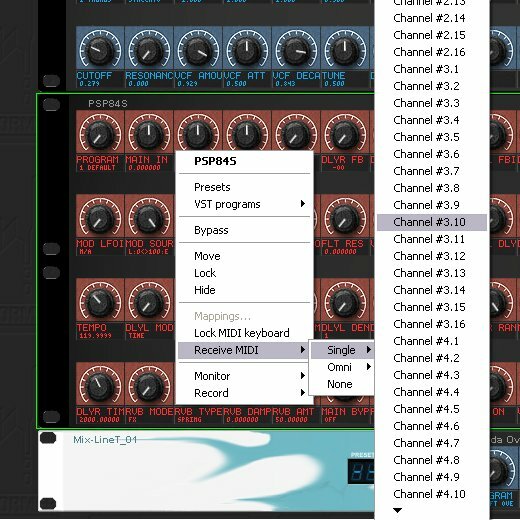 Up to 128 MIDI input channels are supported (8 interfaces, 16 channels each) and data can be routed freely to any module in the patch. 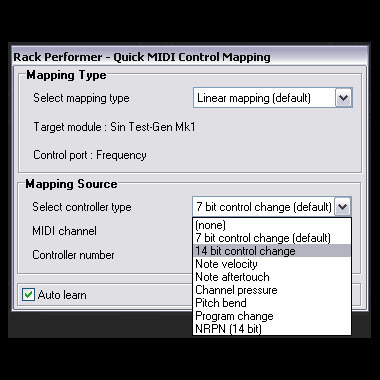 MIDI inputs can be routed per channel (single mode) or per interface (omni mode) enabling control of multi-timbral instruments. 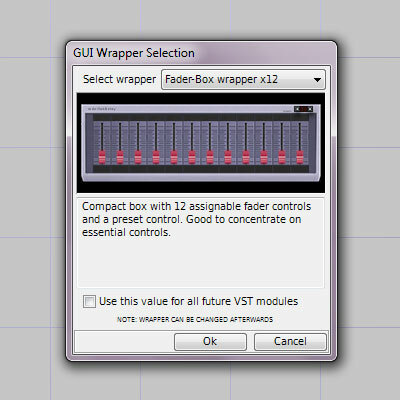 Up to 128 MIDI output channels are supported (8 interfaces, 16 channels each) and data can be sent to hardware effects and instruments by using instances of the special "External MIDI Gear" module. Timing precision can be dramatically increased and jitter reduced with the Turbo-Mode option, which dedicates one processor core to MIDI output. 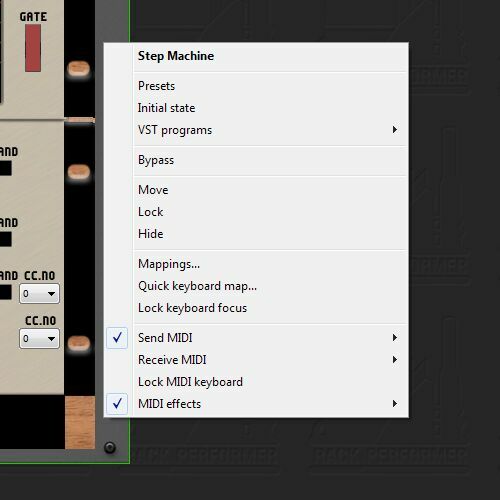 Super fast and easy MIDI controller mapping, just click a control on screen and move a control on your controller and it's done. 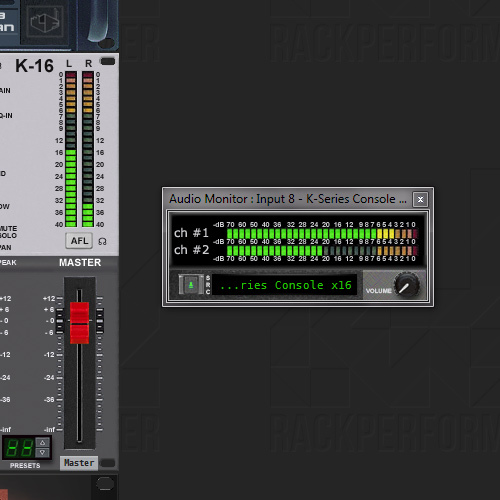 As live performance is all about control, it should be dead easy to configure your favorite control interface. 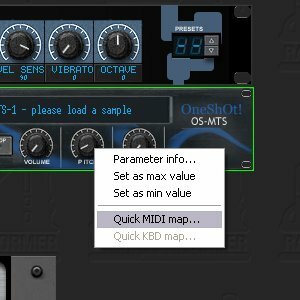 Just right-click on any GUI control and select "Quick MIDI map..."
At this point and in most situations, you just have to move the control you want to map on your controller and the auto-learn function will do all the work for you. 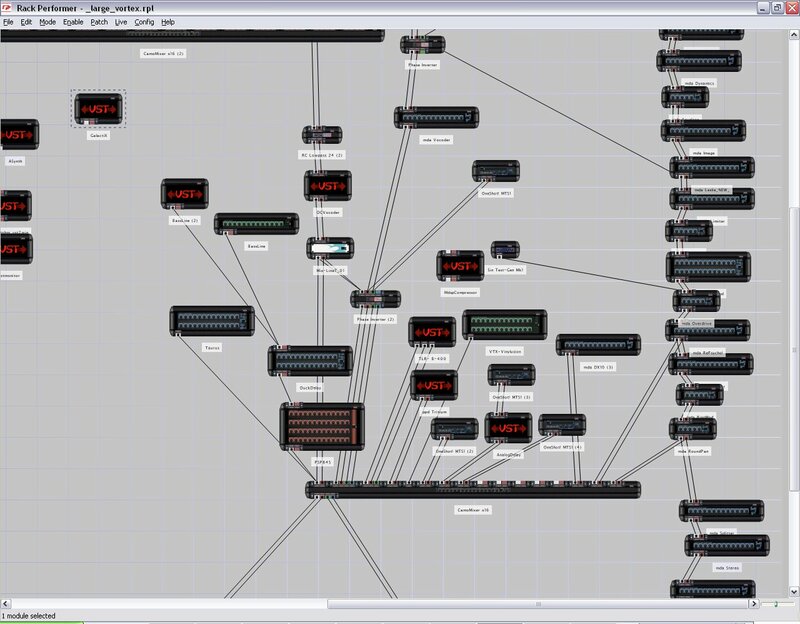 The dialog closes and the control is mapped. 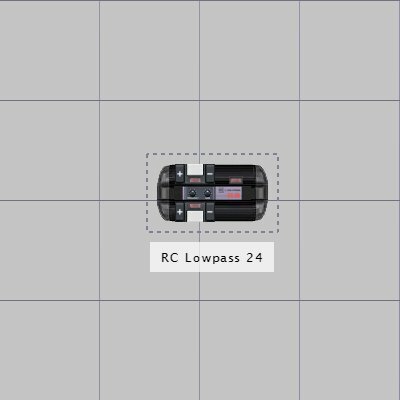 Advanced mapping types like 14bit CC and NRPN are possible, along with linear, exp or log, switch, inc or dec mapping curves. 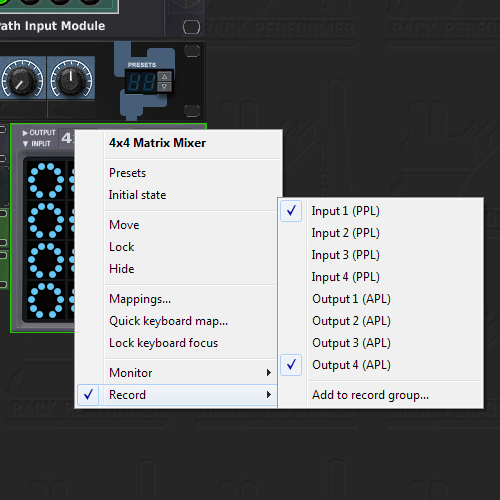 Easily create keyboard splits, layers and merges or transpose notes on the fly by using the included MIDI effects. 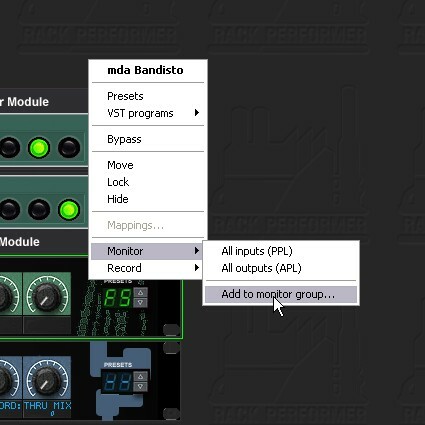 All modules can have MIDI effects applied to their inputs. 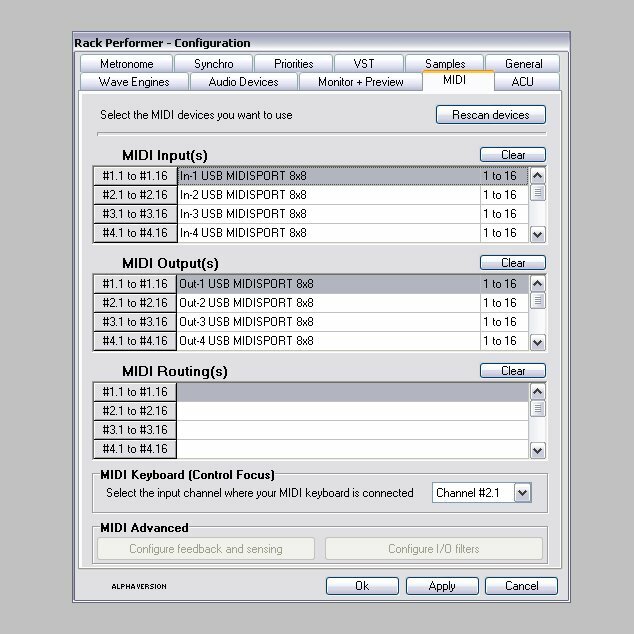 Incoming MIDI events can be filtered by type at three levels: per MIDI input device, per input channel or ultimately per module. 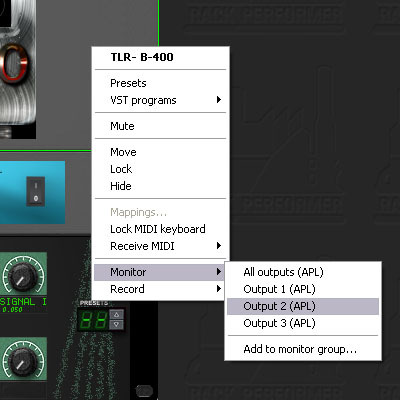 Low-level MIDI routing (MIDI thru) allows to redirect any input device to any output device. 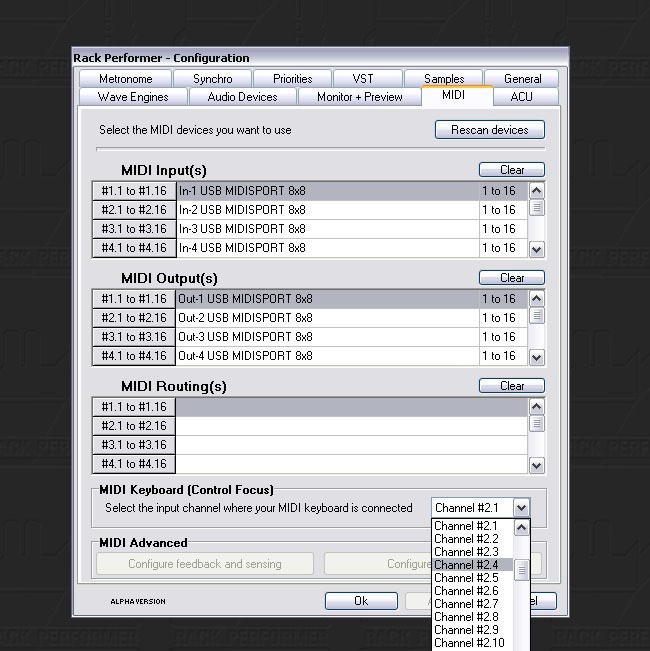 Routing is performed by the MIDI driver itself and thus latency is minimal. 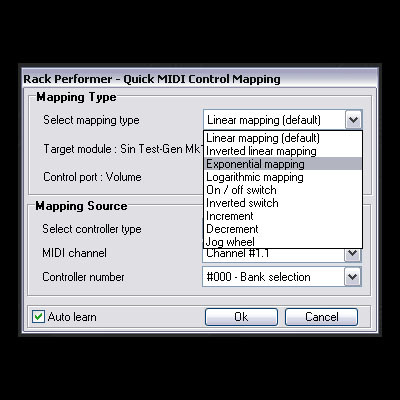 MIDI routing can sometimes replace an external MIDI patch-bay and can be used to daisy-chain MIDI equipment. 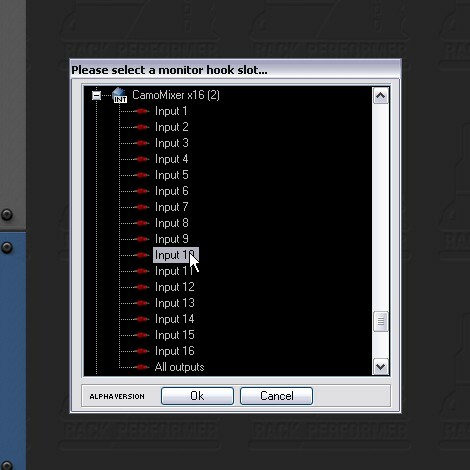 Setup is easy and straight-forward, as seen in the screen shot below. 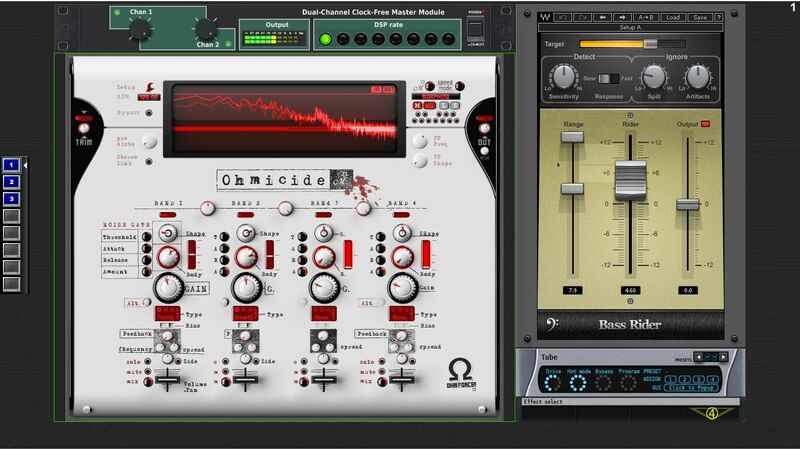 Load any number of effects and instruments and connect them exactly the way you want, including multi-channel and side-chain routings. With the Live Synch slave mode you can join any running master and not only get a perfect tempo/rate locking, which alone would lead to long term drift, but also a full phase-locking, meaning it will stay in tight synch relative to the moment you joined. Even without any synch protocol you can still synchronize to any source exactly like a DJ would do: use Tap Tempo to set the coarse tempo, Sync-to-Push to align the downbeats, then adjust the phase with the V-push or skew controls. Complete integrated metronome with bright LED display, audio or MIDI operation mode. Route it to your headphones and start practicing those steady rhythms! Full automatic patch delay compensation on audio and control signals, allowing to use seamlessly modules having internal latencies. As it is fully automatic, you don't have to do anything to take advantage of PDC. Special modules even allow to manually force additionnal latency compensation or just add extra audio delays, perfect for "round-trip with external procesing gear" setups. 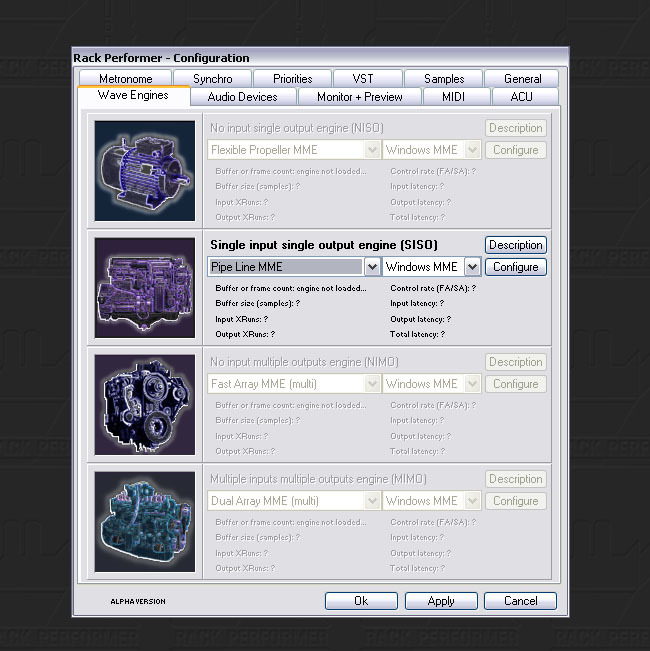 Industry-standard high quality 32 bits floating point internal audio engine, with 64 bits in the critical parts. 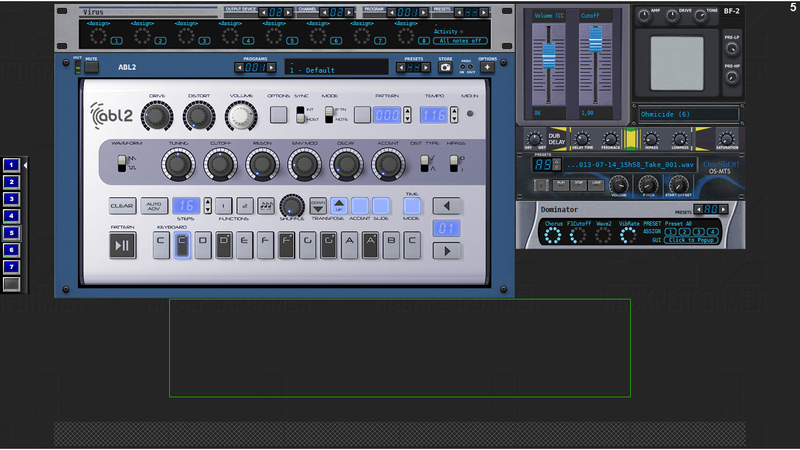 VST plug-ins can also benefit from sample accurate sequencing thanks to this emulation mode. 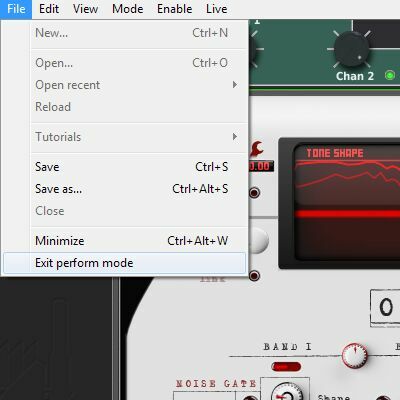 If you need real sample-accurate tight automation and real-time control for your VST plugins, and if you can afford to increase CPU usage a bit, this option can make the difference. Several modes ranging from the default buffer-accurate to complete sample-accurate, including hybrid modes, are available. 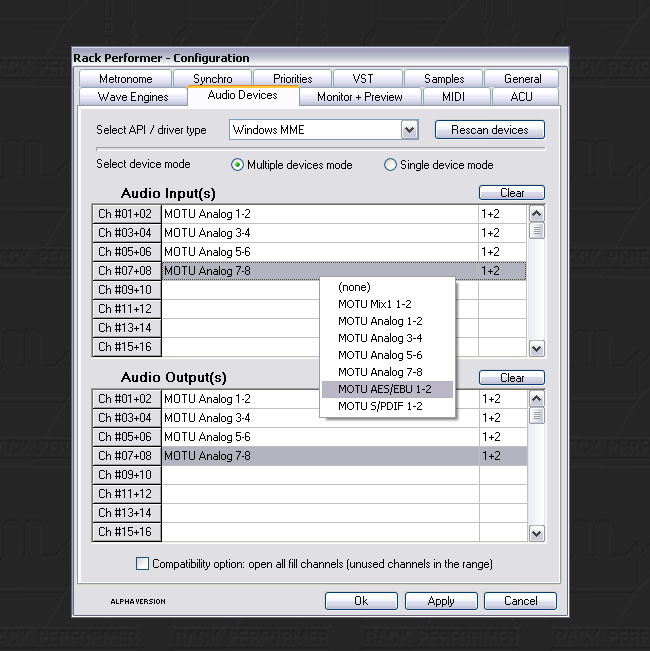 Standard Windows audio drivers support for universal compatibility, in both single and multiple devices modes. Works with all sound cards without exception, very dependable, but offering rather poor real-time performance. 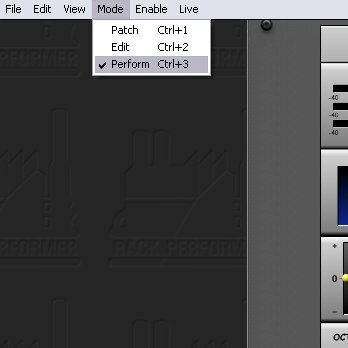 Switching to MME mode can relax your system when practicing or experimenting with new patch ideas. 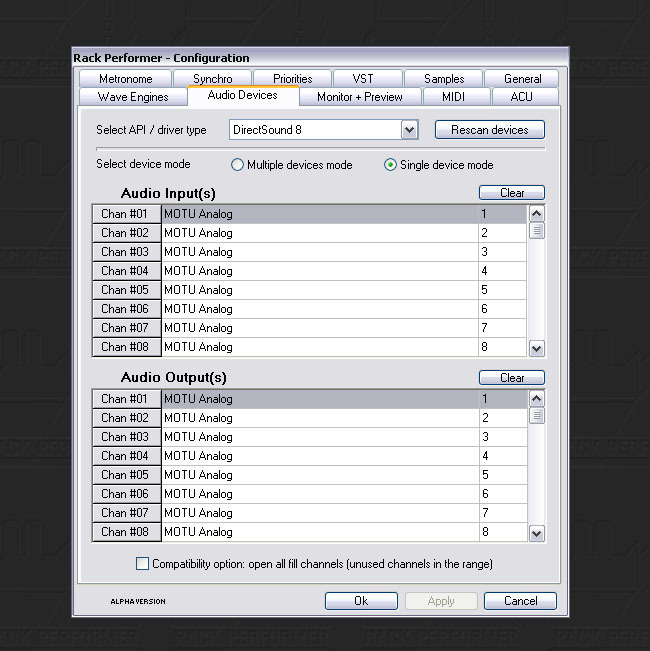 DirectSound audio drivers are supported in single and multiple devices modes. 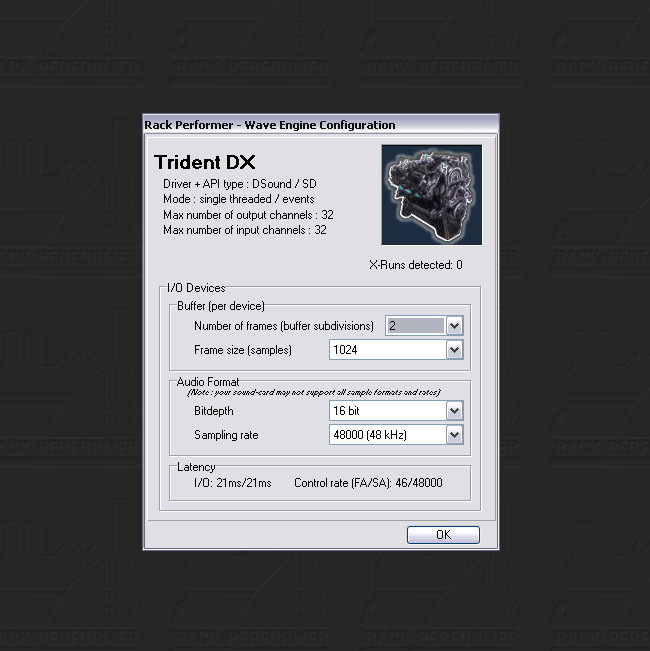 While being there mainly for backwards compatibility and ease of use on multimedia systems, some (rather rare) audio cards do have very good DirectSound drivers offering acceptable performance. 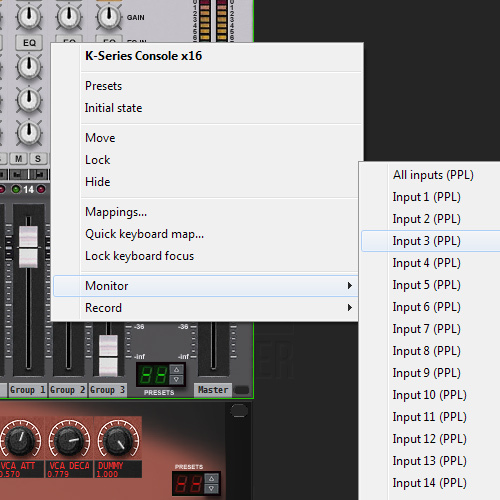 Proper DirectSound configuration is a bit more touchy than the other driver types, if you want to achieve the most out of your system. ASIO audio drivers support, for best performance and lowest latency. When talking about audio stability and latency under Windows, nothing beats a good ASIO driver, period. If you are serious about your music, you'll end up using ASIO one way or another. 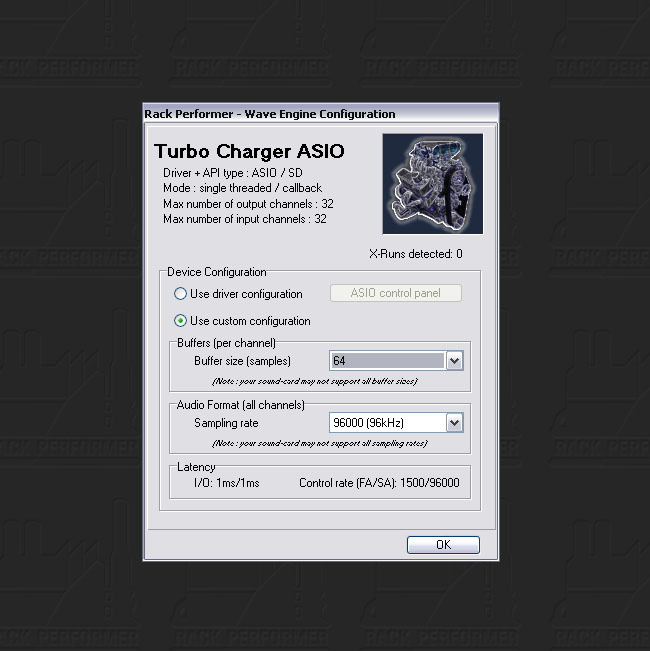 ASIO configuration is dead easy: just select the proper device(s) and it's ready to use. Multi-channel audio content authoring made easy. 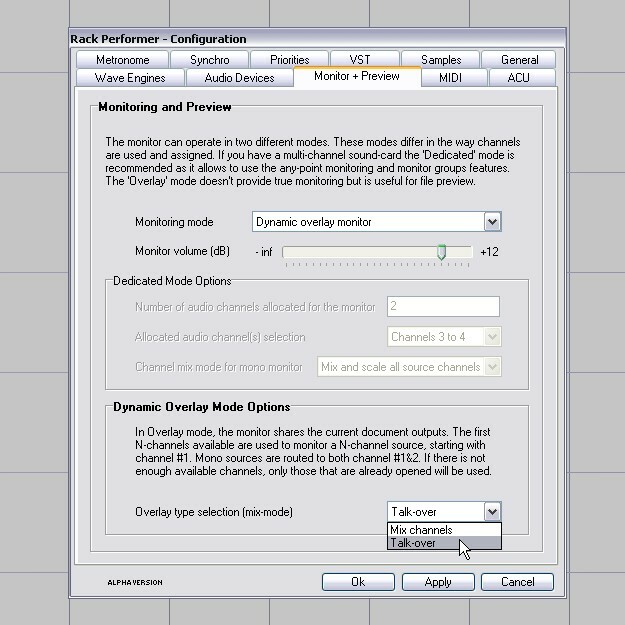 Most modules support multi-channel streams on their inputs and outputs. Why have distinct modules for mono, stereo or multi-channel processing? It's just a matter of patching! 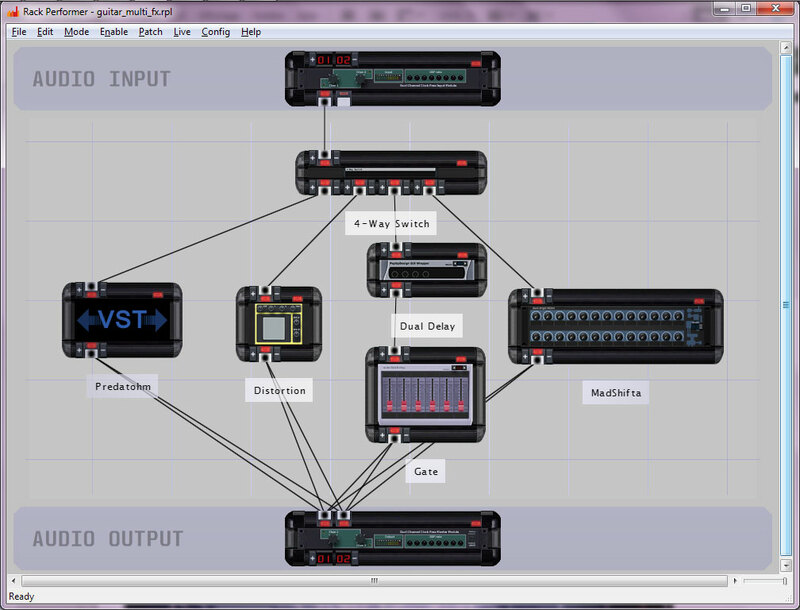 Most modules have variable I/O pins and can operate in either modes depending on how you patch them. Create a module, set the required pin count, then patch and play! 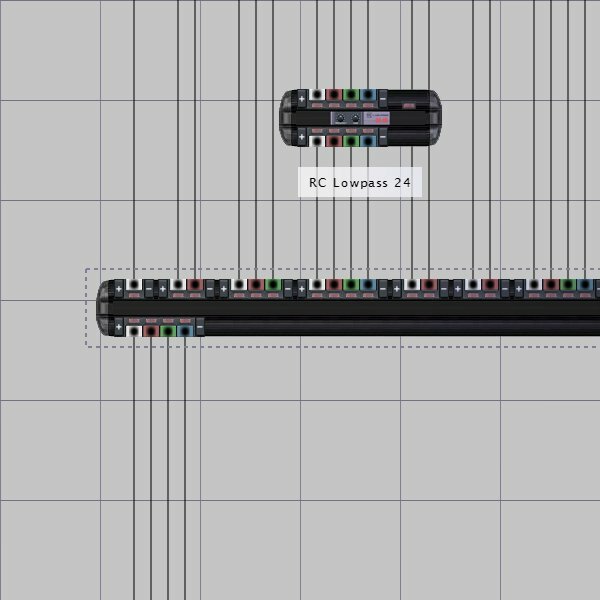 Use up to 32 physical audio input channels and up to 32 audio output channels, why limit yourself to stereo? MIDI Clock is the most standard protocol to synchronize two musical instruments. 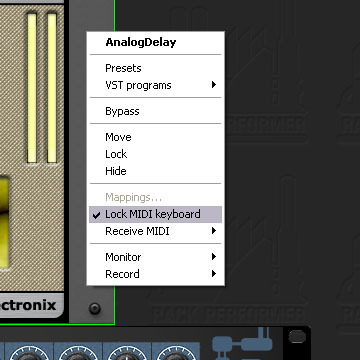 The application can lock its tempo to incoming MIDI Clock. Most beatboxes, drum machines, sequencers and even some synthesizers support the MIDI Clock protocol. 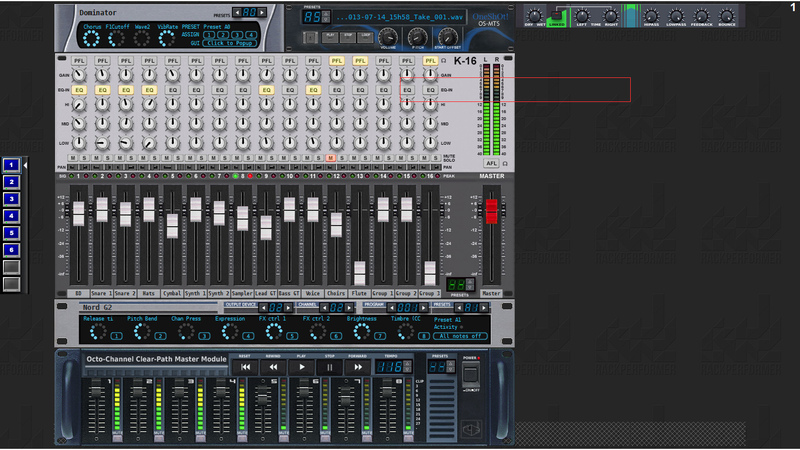 Just connect the master device to the application using a standard MIDI connection and they will synchronize together. Five different synchronization schemes are provided, from ultra-fast convergence with very tight tracking, to ultra-slow convergence with very stable tempo locking, you can select the best compromise for your musical style between fast reaction to tempo changes and minimal wow/flutter effect due to varirate. 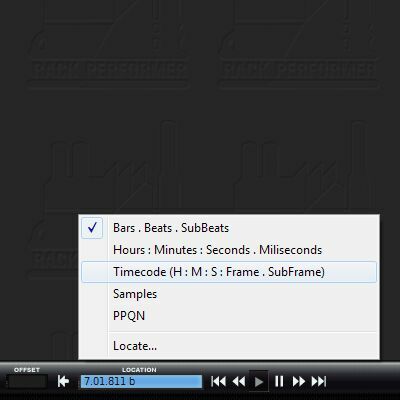 All timecode rates are supported as display and locate mode, including the latest HD ones. 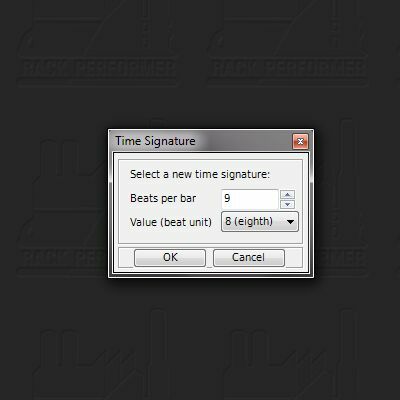 Select the correct rate, set the start offset and you are ready to cue to any timecode. 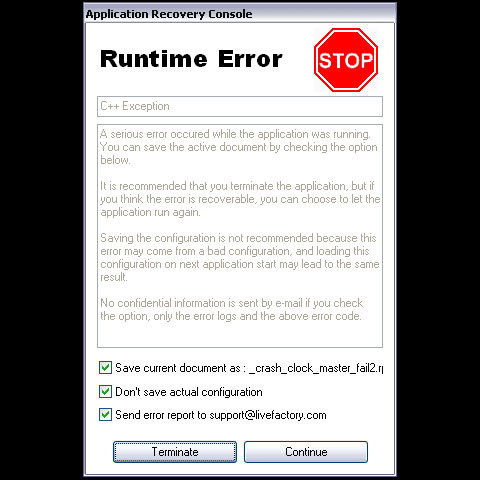 In case of heavy application failure, the application recovery console allows to save your work and to try to recover from the error and keep the show going. Of course, in a perfect world applications and systems never crash. But todays computers are increasingly complex in terms of hardware and software interactions and possible pitfalls. The recovery console gives you a chance to at least save your precious work, and in most cases, to continue to play uninterrrupted.